2017 update on QR labels, GMO foods that are genetically engineered to sterilize or poison animal pests but no FDA labeling on DNA or fertility risk to human consumers! Consumption of genetically altered food crops decode human and animal DNA, diminishing health and reproductive ability! Built-in poison, genetic sterility (non-reproductive code) and other protection against insects, wildlife (and food crop competitors) trickle down into human and pet foods. By the time you watch the 2-minute engineered salmon video below, FDA will have approved the genetically altered monsters which grow twice as fast as wild salmon. Reaching maturity at 17 months instead of 3 years, the monster fish feeds a family of ten! The accelerated growth is achieved by injecting a growth gene from the Pacific Chinook salmon and genetic material from a large, eel-like fish into the fertilized eggs of Atlantic salmon. The recombined DNA in the salmon’s cells force winter growth (like the eel-fish) instead of only in the summer (like salmon). The result is a grotesquely large, genetically engineered Frakenfish ready for your plate in half the time. The Veterinary Medicine Advisory Committee had this to say about genetically engineered Atlantic salmon, "rDNA construct meets the definition of a 'drug' under the Federal Food, Drug, and Cosmetic Act". The VMAC explains that’s "intended to alter the structure or function of the body of man or animal." 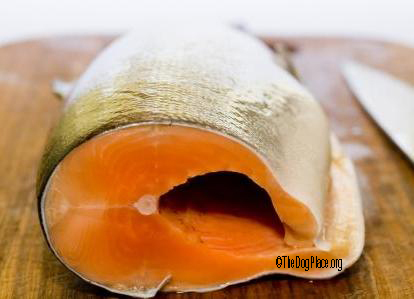 The U.S. Food and Drug Administration began hearings on GMO salmon in Sept. 2010 but that was just a sham-wow show. It closed public hearings in April 2013. As to the risk of transgenic contamination with wild salmon, AquaBounty Technologies says the fish of the future are “generally” sterile, the result of yet another genetic alteration called “triploidy”. That genetic modification is in itself, frightening because it causes sterility by preventing gonadal development. The fish factory says triploidy eliminates any possibility of the GMO salmon breeding to each other and prevents cross-breeding with other native fishes. To its credit, the FDA expressed concern that up to 5% of the genetically engineered salmon eggs may still be fertile. Not to worry, the company will protect its invention by raising the fish in safely contained, inland systems, otherwise known as fish farming but sold as "wild caught." If any were to escape the enclosures… environmentalists say the GMO salmon could wipe out real salmon by eating the fry and cross-mating with adults. Bottom line" April 2013 Reuters reported "the FDA affirmed earlier findings that the biotech salmon was not likely to be harmful and said the agency had concluded that food from AquAdvantage salmon was as safe as food from conventional Atlantic salmon." Farming genetically modified salmon will help to feed a huge population that loves seafood and that supports hungry food producers!!! Aquaculture is big business. From oysters farmed in New Zealand to trout and catfish in the U.S. and tilapia in Asia, millions of tons of fish are farm raised for human consumption. By the way, the genetically altered supermale Indonesian Tilapia (GESIT) is engineered to hatch eggs that will produce 98% - 100% male tilapia so salmon isn't the first “approved” genetic creation allowed on American tables. Shrimp are probably one of China’s biggest food exports, along with the millions of chickens suspended over the shrimp ponds so that their excrement feeds the shrimp… Look up production methods and you’ll stick to Gulf shrimp, demeaned as being oil and chemically contaminated by the Gulf Of Mexico. It is a discouraging choice. When you think about it, genetically created, farm-raised salmon make Chinese shrimp seem palatable. If approved, and it will be, AquAdvantage® Salmon will be the first FDA approved transgenic or genetically engineered animal to be approved for human consumption. That’s a major step forward in scientifically engineered evolution only because it seems to indicate governmental acceptance of what was once hidden from the public. “Wild Caught” fish are always a better choice than farm raised, even with the potentially higher mercury risk and more costly price tag. You will be amazed to learn (below) why distributors can say “wild caught” but are not required to label fish as genetically modified. We hope you are now better equipped to make purchase decisions. Fish is an excellent high protein, low fat food but you might want to consider herring and sardines, both of which are wild caught and relatively mercury-free due to their shorter life span. It’s a toss-up between pork and poultry for second place in the list of genetically engineered FDA animals but salmon will open the floodgates, pun intended. Other organizations have been working to develop genetically modified animals, such as the University of Guelph's "Enviropig" which more easily digests plant phosphorous, thus excreting less of it into the environment. 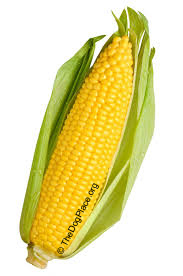 Genetically Modified Corn Turns Deadly? More thought-provoking than GMO pigs, in April of 2010, the European Union Times released a report prepared by the Russian Academy of Medical and Technical Science. 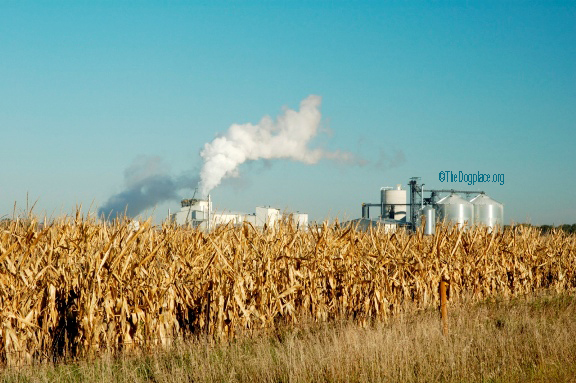 A fatal lung disease believed to be the result of a “crossover” plant disease from genetically modified grains and foods causing a “mysterious die-off” in the U.S. that has killed over two million people worldwide since erupting in Iowa 2008. Haven’t heard about it? The news media suppressed the story to prevent panic but the Russians are smirking at a double irony; Iowa is among the largest corn producers in the world and36 people were infected at a Lung Association event held at the Iowa Governors Mansion. Now there’s one for conspiracy theorists! Tragically, scientists already knew that genetically modified foods can be deadly. L-trypophan, a common dietary supplement, killed 37 Americans before the FDA recalled it in 1989. L-trypophan also permanently disabled or afflicted more than 5,000 people with a painful blood disorder. Showa Denko, one of Japan's largest chemical companies, used the genetically engineered bacteria and paid out over $2 billion in damages. Understandably, deaths from genetically engineered pharmaceuticals and foods are desperately downplayed if reported by the media. None of this comes as a surprise to microbiologists. Genetic modification is used to make food crops resistant to pests. 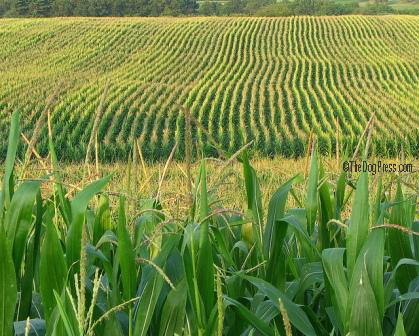 Scientists have created corn that is fatal to the pests that normally feed on it. In 2014 we also released information on the new production of poison wheat. (ref 1) Microbiologists around the world warn that such genetic manipulation can at the very least increase the allergens in foods. Of greater concern is that genetically altered crops can change the DNA of the people and animals that consume it, switching on genes that produce poisons. Let’s hope the Russians don’t catch on to that. Knowledge can protect you but it is indeed frightening because you have so little control over what your are forced to feed your family, and yes, for your dogs. Here is why you need not bother avoiding corn on the cob. In 2011 Bloomberg headlines read “Genetically Modified Corn Polluting Streams, Rivers and Lakes With Insecticides”. No “Genetically Modified” Label On Frankenfoods! If you think the FDA is going to warn you which foods have been genetically modified, altered or created from scratch, think again. 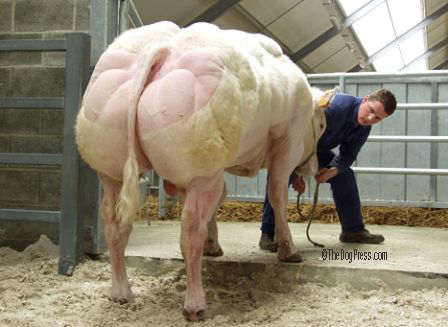 A decade ago, small dairy farmers rebelled against the use of Bovine Growth Hormone (BGH). They gave in or gave up, leveraged by the mega-milk producers when in January 2010, the FDA again refused to require labeling of milk derived from the use of genetically modified hormones in cattle. And here's a "lesson" for you. In a show of support for recombinant BGH, the University of Wisconsin-Madison continues to serve genetically modified dairy products with no warning labels to students and teachers. So how will you know what’s on your plate? With no strong regulatory restraints or FDA labeling requirements, bio-engineers have been creating a plethora of genetically engineered "Frankenfoods". Sure, freaky foods like grotesque salmon and killer corn will feed a lot of people. That is crucial because while Americans practice birth control from adolescence to menopause, other ethnicities are racing to outnumber us - and they are succeeding. Therefore, at the risk of being politically impolite, and with a planet incapable of supporting the explosion of humans, perhaps we should send such genetically modified super foods to those countries? Is animal rage and domestic violence connected by our crops? It's EPA classified "minimum risk " but poses huge risk in foods.